If you really enjoy fried foods but sacrificed the taste of it due to obesity or other health issues, Well, Its time to cheer now. You can have those delicious fries to your hearts delight without posing threat to your health. The Air Fryer is the magic appliance that makes this possible. Instead of deep frying with oil it uses hot air that cooks food with little or absolutely no oil. The food cooked in Air Fryer is crisper outside tender inside and tastes the same as deep fried. You can fry, roast, grill and even bake! An Air Fryer is a healthy fast and easy alternative for cooking your delicious Fries and snacks. The Air Fryer works on the technology called Rapid Air Technology (RAT). The food to be fried is placed inside a basket. Hot air is circulated at a very high-speed around the food basket. The ingredients in the basket gets heated up evenly from all sides which makes it crispy and brown. It instantly heats up. Within a span of 3min the temperature can range from 21deg C to 200deg C so food is cooked very quickly. You can fry, grill, and roast meat, chicken, fish and vegetables. Frozen foods can be prepared in the air fryer without the need of thawing/defrosting. The cooking time will take slightly longer. You can even prepare baked dishes like cakes and muffins too. Ease of Use: The Air Fryer is very user friendly and one does not need any expertise to operate it. The parts of the machine come off easily and can be cleaned easily. The food basket hardly has any grease after cooking so it can be given a quick hand wash with mild detergent or can be washed in dishwasher. Price: Air Fryers are available in the price range of Rs 8000 to Rs 12500. It might seem expensive but you save onto your medical bills plus the expense on oil. So this is an investment with regards to your healthy being. Healthier. Uses minimal oil or no oil. Uses 80% less oil. Oil is merely to baste the ingredients unlike in a deep fryer where the ingredients are soaked in oil. Very fast and even cooking. Hardly chances of food getting burnt. Safer. No risk of accidents due to spilling of hot oil. Cooking area doesn’t get greasy and messy. The air filter ensures an odour free cooking. The machine has Auto OFF feature so no safety threat unlike if you leave your kadhai with oil on stove and forget to turn the knob off. The non-stick baskets are very easy to clean unlike the ordeal of scrubbing your greasy kadhai after a deep fry. More than one food can be cooked simultaneously. Capacity: It is the volume of the cooking basket. The available options are 2L, 2.2L , 3L and 4L. 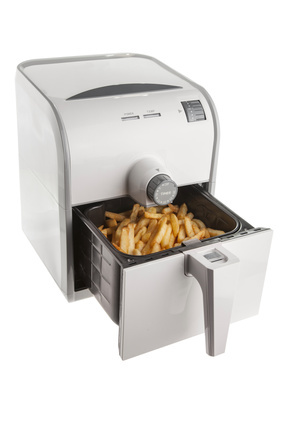 When fully loaded, a 2.2L capacity air fryer can fry 750g of French fries in one go. Temperature Control: Adjustable temperature controls (80deg C- 200deg C) allows you to set the ideal cooking temperature for various food. Some models have preset temperature for certain food. Timer: Models come with a 30min/60min timer. The timer can be set depending upon the quantity and type of food being cooked. The auto shut OFF feature switches off the machine once the timer stops Some models have a “READY” audio indicator. Separators: Basket separators/dividers allow you to cook more than one type of food simultaneously without getting mixed. The preparation time for both type of food should match. Material: The main body is generally of plastic or metal. The food basket is food grade material and nonstick coated. Air Filter: A built-in air filter and air outlet vents absorbs the odors during cooking and keeps the kitchen smelling fresh. Before purchasing ensure the safety parameters and warranty of the product. An Air Fryer is a boon for the diet conscious. Now you don’t have to sacrifice your favourite fried food. This Diwali what else can be a better gift for your family than a healthier safer oil free cooking alternative. So rush and grab the amazing Diwali offers. Bring an Air Fryer home and stay healthy! Previous story Washing machine features dissected!